Our top-priority is keeping Bel Aire, Britannia, Elbow Park, Elboya, Erlton, Parkhill, Mayfair, Meadowlark Park, Rideau, Roxboro and Windsor Park residents informed. All the community’s must-know news is easily accessible through the Bel Aire, Britannia, Elbow Park, Elboya, Erlton, Parkhill, Mayfair, Meadowlark Park, Rideau, Roxboro and Windsor Park community newsletter, which is published monthly so that residents are kept current on relevant community and Calgary news. 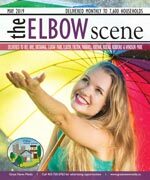 The Elbow Scene is delivered monthly to every household, apartment, and business, and is a great way to get hyper local advertising exposure. Elboya Heights and Britannia have officially merged into a single community association called the Elboya Heights Britannia Community Association. Membership is open to all residents, including home owners, renters, apartment, and condo dwellers. We operate mainly on revenue from membership sales and receive no government funding. The Community Association is run entirely by a volunteer board of directors, elected at our Annual General Meeting each year. In the City of Calgary's 2012 municipal census, Britannia had a population of 803 living in 309 dwellings, a 7.6% increase from its 2011 population of 746. With a land area of 0.5 km2 (0.19 sq mi), it had a population density of 1,610/km2 (4,200/sq mi) in 2012. Residents in this community had a median household income of $120,387 in 2000, and there were 7.9% low income residents living in the neighborhood. As of 2000, 16.7% of the residents were immigrants. A proportion of 19.3% of the buildings were condominiums or apartments, and 19.3% of the housing was used for renting. For more detailed info visit the City of Calgary community profiles site.